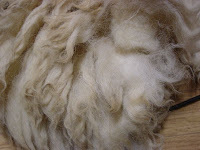 Froggy's Fiber Followings: Sheep are BIG! or Look at my new rug! Sheep are BIG! or Look at my new rug! So I got this killer deal on a fleece via one of my Yahoo groups. 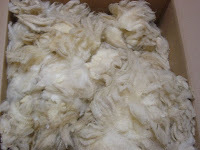 A member of the group was moving North to South in the US and needed to unload some of their sheep fleeces quick. 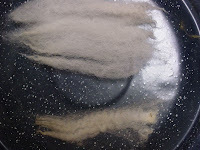 The wool is a Cheviot cross. The description is a bit vague on the cross, something like Cheviot with merino, corriedale, BFL. I didn't know what to expect but the deal was $10 for a fleece plus shipping. 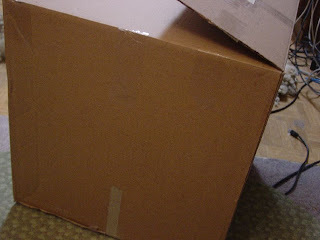 Shipping wasn't unreasonable and the fleece was supposed to be between 3-6 pounds. The only other detail I received (or really asked for) was whether the wool was skirted. All told this is supposed to be skirted for tags and belly fiber but not second cuts. Haven't done a super close inspection but I don't think the second cuts will be a problem. After TheBoy went to bed I pulled out the fleece and took a better look at it. I really wasn't expecting it to be all that big. My husband said when the Postal Worker came out with the box I had a mixed look between good surprise and "Oh my is that mine" surprise. We both commented that it didn't smell like the last time I purchased a raw fleece. Maybe its a difference in breed. I do recall the first one was supposedly smellier because it was a ram fleece. I already got a look at a cleaned piece, its very white much to my surprise. The nicest part had quite a good bit of crimp on it and I can definitely tell the different sections. Just by looking I could guess the spin-able portion versus the felt-able portion versus the "better blend with this" portion. What I need now is a good tutorial on how to appropriately pick a fleece apart and what to do with it. Overall, I'm very pleasantly surprised. I still see some very dirty sections that I would much rather not have to deal with but those are few and far between. Should I need a fleece in the future I will definitely consider going to this person's site to see what they have available (should they continue in their new location.) 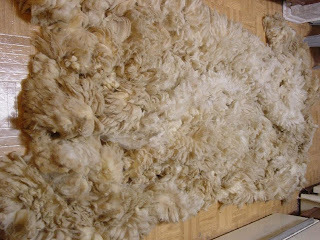 Plus, I saw that they do mohair fleeces and even though I said I wouldn't do raw locks again, this type of quality is tempting. I am not expecting to have to pick out lots of seeds or hay or grass. I pulled some larger pieces out and a little dried corn but hey, a sheep's gotta eat! Expect more fleece-y details in the future. This is definitely a project and one I think is worth of following. 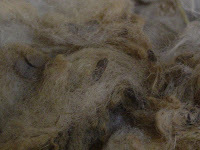 Now.... send me some links on deconstructing a fleece! I'm going to need it!